Channel catfish have a reputation for a propensity to eat almost anything containing amino acid. A popular concoction of cheese and fish leftovers is enough to close restaurants for a half mile around. The smelly mixture is stink bait, dip bait or cheese bait. It and any needed gear can be purchased at the Rock River Outfitters (www.rockriverouttfitter.com) in Oregon, Illinois at the dam. Oregon is about an hour drive west of Chicago. There are extensive opportunities for bank fishing along the length of the Rock River in the state parks as well as many municipal fishing areas. One of the better ones is at the dam in Oregon. Upon opening the container you need to stir it with a stick to mix the ingredients that often separate on the shelf. Into the mix you dip a plastic worm designed to hold the mix fast. Several types of dip worm are available on the market and all work as well. The mix should have the consistency of mayonnaise. If too thin add flour to thicken. If too thick add water to get the right consistency. The plastic dip bait worm also has treble hook. The fish mouths the cheese mix and the angler sets the hook. Most anglers prefer stiff long rods with bait casting reels and a clicker. Spinning rods work equally as well but lack the clicker feature. Monofilament line in the 15+ pound class is good. Usually a lead egg sinker of 3/8th ounce up to two ounces is preferred. Braided line offers the strength of high test with the physical diameter of a much lower test line. 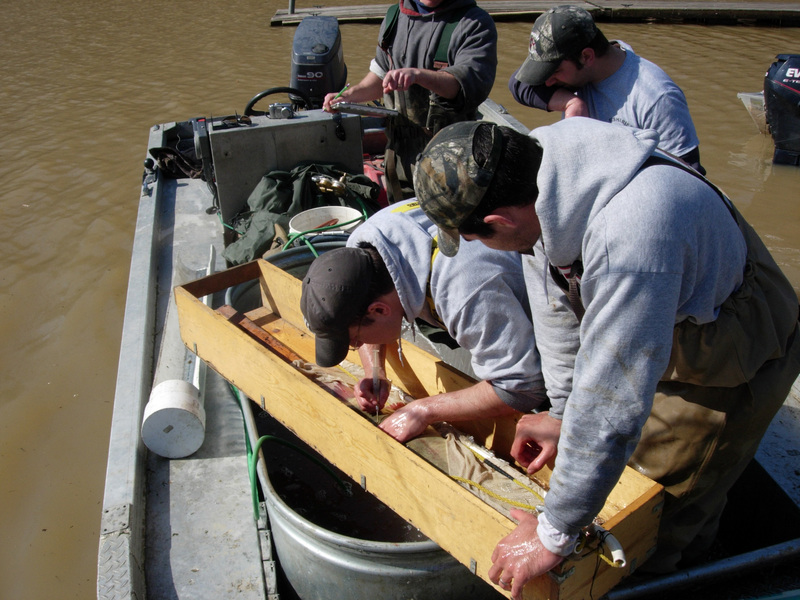 Lower, or cast, the lure into holes of the riverbed or other structural features such as logs, root balls, etc. This same pattern sometimes works with live minnows or nightcrawlers. Most anglers have caught small bass. But never have they seen anything as small as the bass on view one day last spring. The biologist at Little Grassy Fish Hatchery near Carbondale, IL was showing a bass hatched 3 days earlier. The little rascal is about the size of the period at the end of this sentence. Not what you call a keeper. Very few people are ever able to find such a fish in the wild. When bass are so small they do not even feed. Instead, they live off the yolk sac and just sit on the bottom of the body of water in which they hatch. As they sit there, the male bass watches over them and will stay with the tiny offspring for the first few weeks of their lives as protection from predators. The protection is necessary in the wild, as bass do not lay as many eggs as some other fish. Small bass stay on the bottom for a few days until they begin to feed on the Zooplankton in the water. Then they begin to move around. In the hatchery, this is a sign to move them to a different area. There they are fed and cared for in immaculate conditions resulting in a greater survival rate than could be possible in nature. Little Grassy Hatchery is one of the Illinois Department of Natural Resources hatcheries producing largemouth bass, channel catfish, bluegill, redear sunfish and walleye stocked into the lakes and ponds of the state. Each year thousands of fish reach fingerling size, bagged in plastic bags, oxygen added and they shipped out to locations all over Illinois. With the exception of the channel catfish, the all fish go as fingerlings. Channel catfish remain at the hatchery until they reach 8-inches in length, usually about a year. Channel catfish are spawned in the hatchery and fed a high protein fish food. Each breeding pair of catfish produces one to four pounds of eggs. The hatchery usually can produce two spawns per year with a total production of approximately 2 million eggs. They spawn around the first of June and by October have reached a length of four to six inches. During the colder winter months, catfish do not feed and therefore there is no growth. But the following spring they begin to feed again and by July first they are up to the 8-inch length so popular with anglers across the state. These fish go to put-n-take ponds on state property and forest preserves. 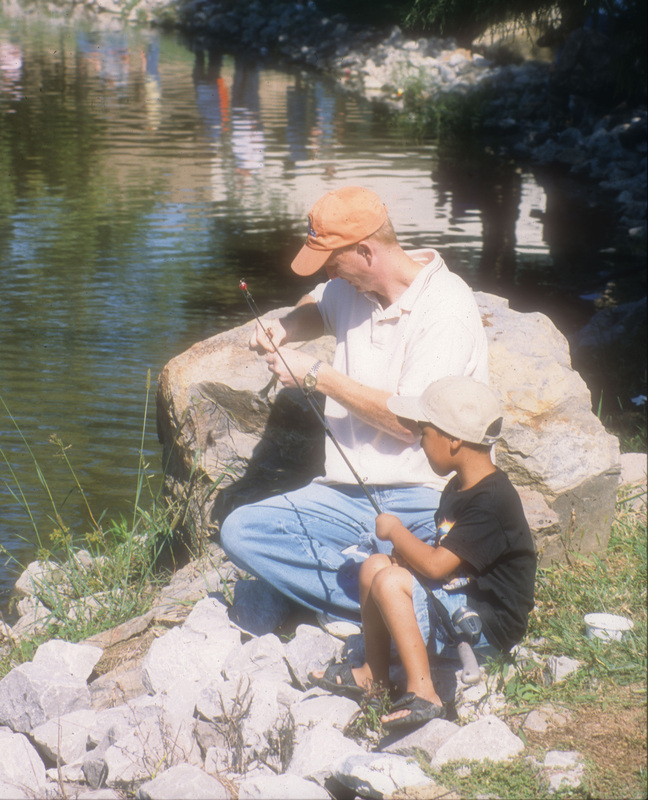 Many of the fish go to local municipal ponds and lakes providing fishing fun for families. Little Grassy Hatchery is located near Little Grassy Lake southwest of Marion, Illinois in Williamson County. Little Grassy Lake is part of the Crab Orchard National Wildlife Refuge. The hatchery belongs to the Illinois Department of Natural Resources. Visitors are welcome and most of the action occurs from mid-May through July. They have a variety of fish in various stages of growth and spawn. The water bill for an operation the size of Little Grassy Fish Hatchery would be out of sight if one had to depend upon city water. The hatchery has a cooperative water agreement with The Crab Orchard National Wildlife Refuge to take water from Little Grassy Lake at the spillway, use it, clean it and return the water to the lake. It works out very well for the production of fish for Illinois anglers. 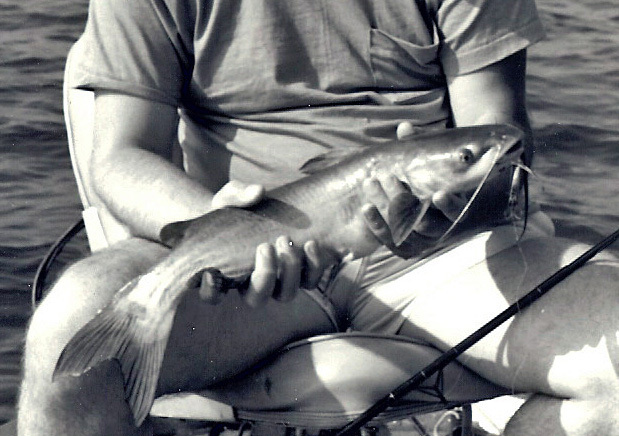 Growing up in a Tom Sawyer-like existence, it was only natural that Larry Woodward would become a catfishermen. Woodward, a veteran angler, guide and television host, has lived on the Mississippi River all his life. He loves those whiskered wonders that prowl the big muddy. Sometime back we sat down at a dinner and he explained how to catch catfish on a crankbait. It is probably no surprise that Woodward would pioneer a new technique for catching cats with crankbaits. Woodward states that his technique works best from the first part of May to the first part of August in most years. He is quick to state that the water conditions need to be right. Those conditions are clear water and a slow flow. “The slower the flow the better,” says Woodward. “The water does not have to be super clear,” explains Woodward, “But, you need good water quality and slow current.” It does not work in tailwater type conditions. Larry believes his technique will work in lakes, rivers and ponds. “It works anywhere there are rip rap banks next to deep water,” explains the cat master. “I fish a couple different crankbaits,” says Woodward. One is a Rebel Deep Teeny Wee-R and the other is the Rebel Deep Wee diving crayfish bait. He likes the 3 inch bait with a dark brown or black back and a hot red or pink belly. Other combinations of colors that work for Woodward are chartreuse/lime, chartreuse/orange, and brown/orange. Larry is quick to add that when the fish are really biting, he thinks that it does not matter what color is on the lure. By way of explanation Larry points out that he trolls crankbaits, rather than cast them, in order to keep the lure in the strike zone of the fish. When retrieving a crankbait that has been cast, the lure strikes the bottom and then almost immediately begins returning to the surface as the retrieve continues. Larry points out that looking along a shoreline, there is a lot of rock and rip rap to be covered. In order to cover more of the bottom and to keep the lure in the strike zone, he began to troll them. In trolling, he uses only his trolling motor turning his big motor toward the shore. This kicks the bow out just the right amount to allow him to run three lines. The trolling motor allows Woodward to move the boat slightly faster than the current to hold the lure bouncing along the rocks. The guy in the front of the boat has a Deep Teeny crawfish crankbait with the front hooks removed and a #6 treble hook on the back. The bait is built as a crappie lure but Woodward finds it is deadly on catfish as well as other species. The second angler in the boat can run two other lines out with the earlier named crankbaits that also run deep. With all the lines running about 50 yards behind the boat, it is possible to keep all three lines about a foot apart and on the bottom. Woodward likes to run this pattern in eight to twelve feet of water, sometimes more shallow. At one point he found that his lines were breaking off when he was fishing some waters. Much to his chagrin, he found that the rocks were covered with Zebra Mussels and the sharp edges of their shells were cutting his lines. He experimented with several of the “super lines” with no success. It was then that he turned to thirty-pound steel leader. He uses about a one foot length as a leader and that has greatly reduced his loss of lures due to the mussels. If the conditions are right on a given day, this pattern will produce non-stop action according to Woodward. It works pre-spawn, post spawn, and during the spawn, on all three species of cats to be found in the big river. He also says that it will also catch other species. Larry’s best day with this pattern produced 17 different species. His largest catfish taken with this pattern was a thirty pound flathead. Although Woodward uses his crankbait pattern most on the Mississippi, he has used it in lakes and many smaller rivers from Missouri to the Canada border. Economic conditions in recent years have forced people to make hard decisions on the use of their discretionary income for recreational fishing trips. Family responsibilities demand we do better and more efficiently add to the recreational experience. Summer vacations might be a week or two in duration. More often they become a day or two. Here in Illinois, the public land use offers a multitude of state parks, federal land, and county forest preserves providing chances for all members of the family to enjoy good fishing. “Happy Hours” by its very definition involve all members of the family and all levels of fishing expertise. In order to fulfill that demand, we have to look closer to home to make maximum use of the time available. Keep in mind that it is an enjoyable experience that is both rewarding and worthy of repeating. The rewards of introducing youngsters to fishing are many and they offer the opportunity of passing along simple traditions and ethics in the outdoors. Advanced anglers may want to use sophisticated tackle. But for the novice tackle should remain simple. It can be as simple as a bamboo pole, line and hook. For the more advanced, but not highly sophisticated angler, it can mean a simple spincast rod and reel combo. If the demand is there, later one can move to more sophisticated tackle. “Happy Hours” are a good time to teach simple conservation messages. Such messages as catch and release, picking up litter and the importance of clean water quality are just a few important traditions. Research shows that children who feel connected with nature have better physical, mental and emotional health. Do not overlook the time spent in planning trips afield. Finding new places to fish near home can be an enjoyable activity for all members of the family. It is a time to explain to the younger set just what to look for in a new fishing hole. Maps downloaded from the internet help in the plan to fish specific parts of a lake or river. They provide a teaching moment without taking up valuable fishing time. An excellent online source of information about lakes and parks owned by the Illinois Department of Natural Resources is their official website. More specifically check at http://www.dnr,Illinois.gov/fishing/Pages/Placestofish.aspx. 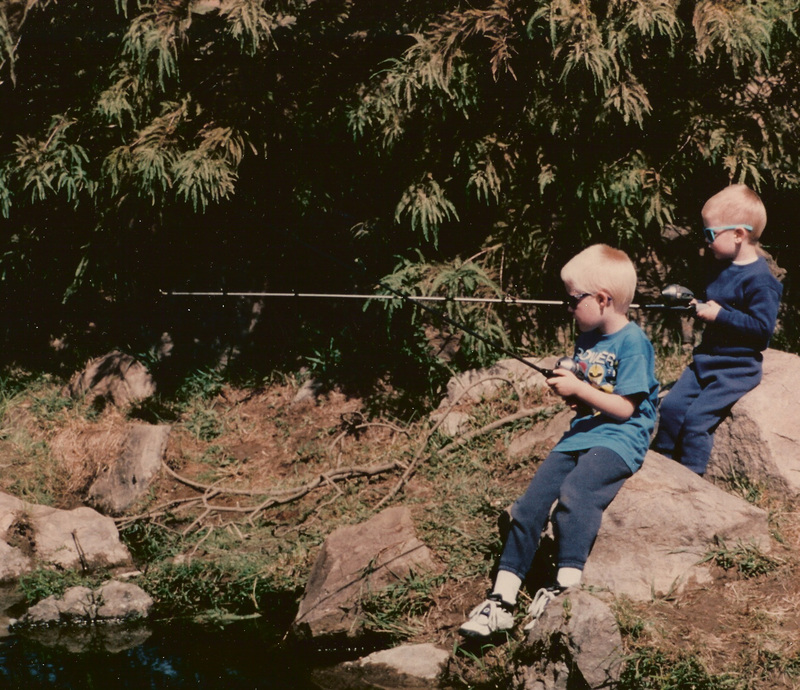 Here are family friendly fishing locations and advice on how to plan “Happy Hours” near home. It seems that one always forgets something in the build up to a hunting/fishing vacation. In some 50-plus years of taking such trips, I do not recall ever having packed everything needed. You just need to accept that you will forget something. Most common items forgotten are such things as toothpaste, shaving cream, tooth brush, soap, etc. If you think of it soon enough there seems to be a Walmart, Dollar General or similar store in almost every town. Otherwise many motels, hotels, etc. will provide you with replacement products, usually at no cost. But what if you forget the larger and often more vital items? What happens to a bow hunt if you forget the box of arrows you just purchased for this hunt? How about ammo for that rifle or the flys tied just for this trout fishing trip? Perhaps you need a change of clothes due to an unexpected change in the weather. It really came home when I began to travel internationally. No packing system is “idiot proof.” Here are some suggestions for your next trip that may help. About six weeks prior to the trip, begin making a packing list. You will continue for weeks thinking of things to add or delete from the list. Leave the list out in the open so it will remind you to examine it periodically. Also review it after the trip to see what you should have included and did not. Items for any trip need to relate to that particular activity. However they usually fall into three categories: personal, clothing and gear. Personal items include such things as toiletries, sun glasses (prescription or otherwise), medications, etc. If travel is to a remote location or for an extended period it is wise to carry a copy of your prescriptions for medications and eyeglasses. An online source for prescription sun glasses is http://www.saltcityoptics.com/all/prescription-sunglasses.html. Their interactive website offers instant communication about prescription sunglasses and variety of manufacturers. The personal items also include items of identification such as driver’s license hunting license and tags as well as passport and visas. Clothing for trips to such locations as Africa can be limited. Usually 2 or 3 changes are all that is required as they do laundry daily. Tailor your selection of clothing to weather and climate conditions. Check with your outfitter as to what you need. Polypropylene underwear is handy even in mild weather as it can double as pajamas against cooler nights. Rifles, cameras, bows, ammo, arrows and fishing gear all fall in the final category. Trips within the US and Canada usually mean that additional gear is available in the area. However in other parts of the world replacements probably will not be available. Depending upon the purpose of the trip tailor your gear requirements to provide the minimum you will need. Remember that weight is important in planning as the airlines are charging some pretty hefty fees for overweight items. Pack as light as possible. It is a good idea to keep a journal while on any trip. You will be glad you did when you look back on your vacation and remember things you might otherwise forget. Take lots of pictures. Digital cameras allow you to take hundreds on a single card. One final caution is to carry as little currency as possible. Make use of hidden money belts, travelers checks etc. Carry your wallet in the front pocket of your pants to avoid pick pockets. 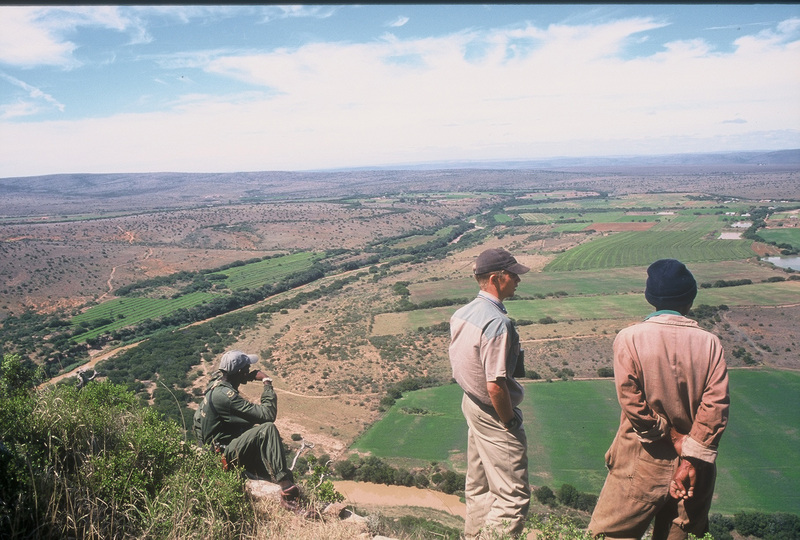 If booked with an overseas outfitter you might want to consider a bank transfer for your guide and outfitter fees. Anticipation is high as the geese circle the field before cupping their wings for landing. As they approach the decoys and are about 10 feet above them, the guide shouts get them boys. We all rise and begin firing. As the birds start to fall, a blast from the right explodes just a foot or two from my right ear. The pain is sudden. The ability to hear takes a few hours to return but it is apparent I have lost some of my hearing. Up to this point I have never given much thought to the loss of hearing one experiences from loud noise such as gun shots. It just seemed to go with the territory. Reading about it never really hit home. Following this experience some 15-years ago, I began using hearing protection on the shooting range but had trouble using anything available in the field. Foam inserts keep falling out and also hinder conversation with companions in the field. Muffs also block some talking and are hot and uncomfortable in warm weather. More recently muffs that electronically block sound at certain levels are more like what I seek. Conservations with companions are possible but they are still bulky and hot under certain field conditions. They work on the range but under hunting conditions they are less desirable. At a recent Association of Great Lakes Outdoor Writers Cast & Blast event Lance Kraemer of Starkey Hearing Technologies (www.starkey.com) introduced us to a new ear plug called SoundGear produced by their company. Their company seems to specialize in high-Definition sound enhancement. 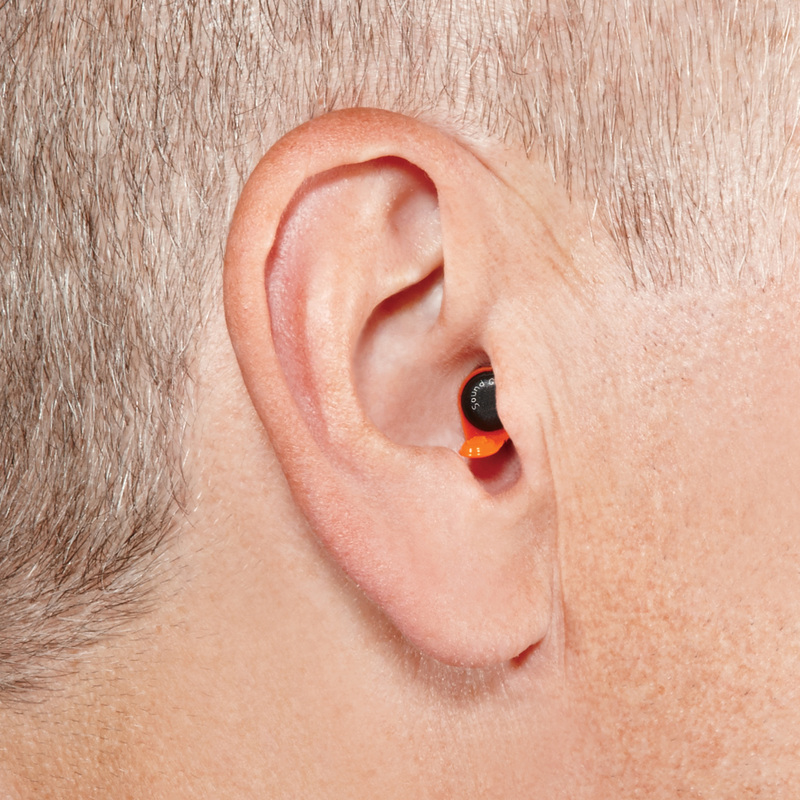 The product is an all-digital electronic hearing production item that comes in three styles. The one I prefer is an ear plug fitting in the ear canal. They also make a behind-the-ear model and a custom molded model. It fits into the ear canals and stays put unlike the problems I experience with foam plugs. The unit is smaller and has a baffle type appearance. 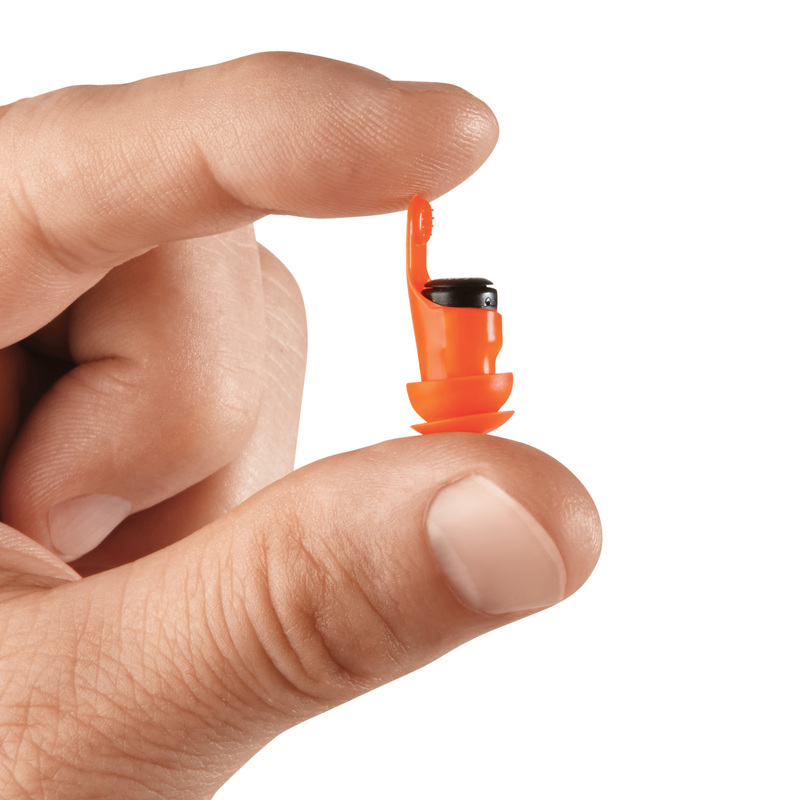 A very small (#10) hearing aid battery delivering up to 140 hours of protection powers the electronics. If continuous protection is not required you simply remove the battery from the device and re-install it later when needed. Plugged into the ear it allows protection from loud blasts such as a high-powered rifle yet allows one to hear normal conversations. Once home it was imperative that I test it out on the range as I sight-in my rifle for the next week’s hunt of exotics in Texas. It works similar to the electronic muffs I use normally with more comfort and flexibility. The units stay in place unlike foam plugs. A few days later in Texas, the opportunity to test SoundGear in the field meets with similar success. I even get to test them in rain conditions. They work perfectly. I am sold on this product. 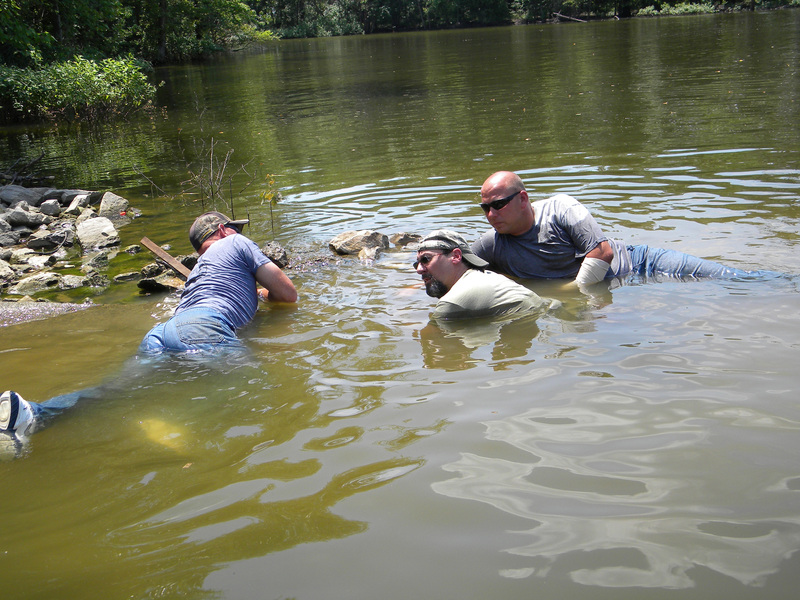 Reaching into an underwater den and pulling a big flathead catfish out by the lower jaw is probably a rude surprise for the catfish. It is great fun for the angler. The origin of the sport is lost in antiquity. It most likely was the invention of some hapless angler needing food and without any other means of catching fish. Known locally as hoggin, it also is referred to as under banking. Practiced throughout the Mississippi river drainage, in some areas it is also known as noodling or grabbing. 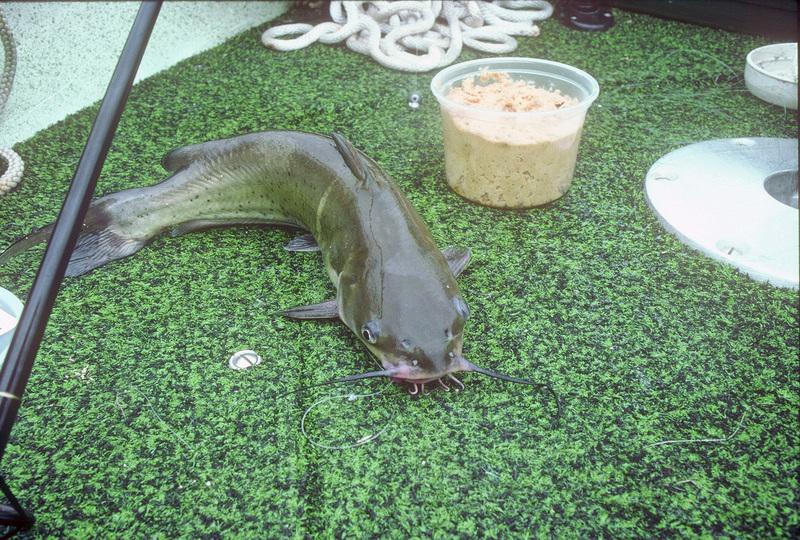 Flathead catfish inhabit mostly larger waters such as lakes, reservoirs and major rivers. Different from other subspecies of North American catfish they have a wide flat skull with prominent eyes set high on the top. Flatheads have a square tail and their overall color is brown with a white tip of the upper lobe of the tail. Illinois flatheads generally are 15 to 35 pounds with some exceptional ones up to 50 pounds. However the state record is 78 pounds. Although catfish hide in dens at almost any time of the year, the prime time tends to be in spring as water warms into the 65 to 75 degree range. Most dens have two or more entrances. Some dens can go back under the shore or other structure six to eight feet. In Rend Lake they may be under old foundations, slabs of concrete, old roadways, rip rap, piles of rock or concrete dumped in the lake at the time of construction. Hoggers find an active den by sliding a foot along the bottom in search of an area clean of mud or debris. For deeper dens in water chest deep they may have to dive down. These dens are usually the least pressured and most productive. The best months for hoggin are June and July. Hoggin is not for the feint-hearted and is not for the lone angler. Guide services such as Rend Lake Crappie Masters (www.rendlakecrappiemasters.com) and Crappie Predator (www.crappiepredater.com) specialize in hoggin at Rend Lake. It is an adventurous part of our fishing heritage worthy of conserving for the future.